Welcome back for the Humpty Dumpty Doll Tutorial and Pattern! In the process of turning the pattern into a PDF, it got shrunk slightly, so I've noted to add a 1/4" seam allowance to each piece when cutting. I don't have pictures for everything. So, if you have questions, feel free to leave them in the comment section. 1. Choose your fabrics and gather materials. I just used scrap material that I had around. I chose 5 different fabrics for the following: Face/Hands, Body/Arms, Legs/Bow tie, Spats/Collar and Shoes. You'll need scissors, pins and some coordinating ribbon and thread. 2. Cut out the pattern. 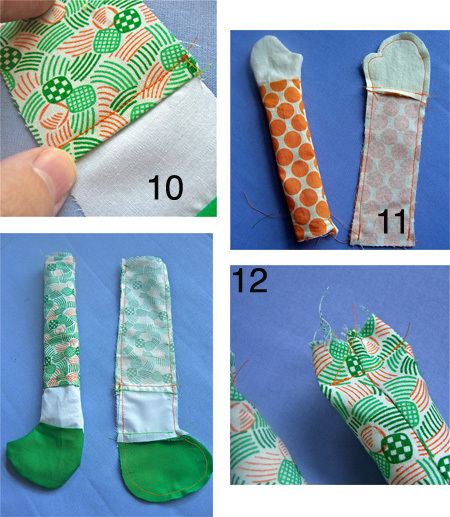 You'll need to make sure to cut out 4 each of the shoe, spats, legs, arms and hands. You'll also need 2 each of the body, head and collar. 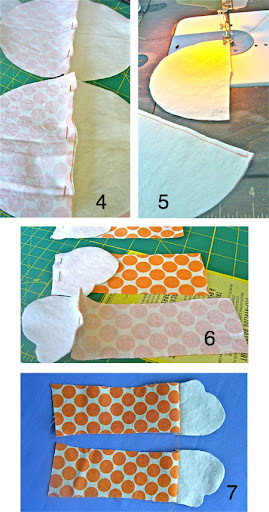 Make sure to fold fabric at indicated fold lines before pinning and cutting. 3. Pay attention to how you are cutting. I laid out all of the pieces after I cut them to make sure I had both right and left legs/arms when all of the fabric pieces are right sides facing out. 4. Pin one head piece and one body piece together, right sides facing each other. Repeat with other two pieces. 5. 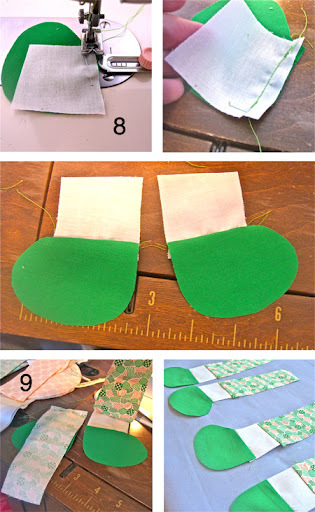 Sew both along the straight edge. 6. Pin one hand and arm piece together right sides facing each other. Repeat 4 times. 7. Sew hand and arm pieces together. *After sewing each piece, I made sure to iron the seams. 8. Pin together shoe and spat pieces. Right sides facing each other and repeat 4 times. Then sew together. *As I went along, I checked to make sure that I did indeed have a right and left leg/ right and left arm. I was a little paranoid about it. 9. Now pin spats and leg pieces together. Right sides facing each other and repeat 4 times. Now iron the seams. * I ended up ironing the seams for the shoe/spat and leg/spat opposite each other. I wanted the leg (or pant) to look like it had a slight cuff over the spat. If that makes sense. 10. I further defined the cuff look by sewing a straight seam across the outside of each leg. 11. Pin two arm pieces together, right sides facing in and sew together leaving the top open for stuffing. Repeat for the second arm. Pin two leg pieces together (make sure the cuff line matches up), right sides together and sew together leaving the top open for stuffing. Repeat for the second leg. 12. Stuff arms and legs leaving about a 1/2" of fabric at the top. Sew across the top to secure the stuffing. *While stuffing, I left each limb a bit sparse were the knee/elbow join would be, so that they'd still have a bit of movement. Just don't overstuff. 13. Pin and sew head/body pieces together. Only sew across the head portion, leaving the body open. Pin the arms in on each side of the body. I hand stitched the arms in place. *thumbs pointing up. 14. Stuff the head and body. 15. *This is the trickiest part of this whole project. Pin the rest of the body closed and pin in the legs where you want them. 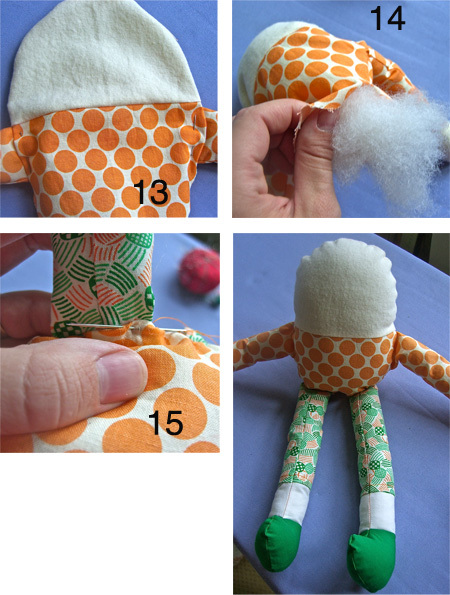 Hand stitch the body closed and stitch in the legs as you work. I just tried to make my stitching as neat as possible. Before you completely close up the body, add extra stuffing if needed so that the body is nice and filled out. 16. Now I wanted to add a few details. 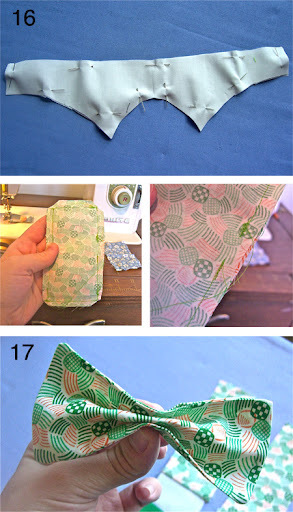 Pin the two collar pieces together and sew. I left the middle bottom section open for turning. Just make sure you leave an opening for turning. Then iron. 17. Cut two rectangles (as big as you want the bow tie to be) Pin and sew the two rectangle bow tie pieces together. Leave a space for turning! I trimmed the corners before I turned it right side out. 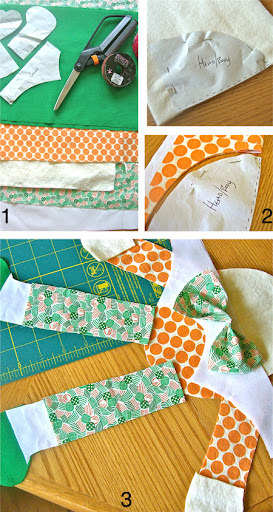 Then iron and stitch the center together to create the bow tie. 18. I sketched out the faces I wanted to use. Then I used a disappearing ink quilting pen to draw them onto the fabric. That type of pen is awesome. It makes it really easy to fix any mistakes. I used fabric paint for the faces. I like the Scribblers fabric paint. You can find it at Hobby Lobby for a $1 per bottle. 19. Cut out a rectangle of head fabric and round the corners. I wanted this piece to be about the same width as the doll face and just a little longer to accomodate the seam when stitched on and to leave a little to tuck into the collar on front when in use. Paint your "cracked" face onto this piece of fabric. *I didn't want this to fray, so I used some liquid fray block around the edge of the fabric. Make sure you spot check it on your fabric first to make sure that it dries clear. 20. You're almost done! Some last details: Cut a bit of ribbon (I like to use a polyester blend so that I can melt the edges of the ribbon to prevent fraying). I folded down the top of the collar to shorten it a bit and then sewed the ribbon to the top of the collar. Then I cut a small piece of ribbon and attached it around the middle of the bow tie. Attach the bow tie to the collar. Now stitch the collar around your Humpty Dumpty. I left a little bit of a pocket at the top of the collar while stitching where I could tuck in the bottom of the alternate face. 21. I didn't picture it, but now you'll want to attach the "cracked" face. 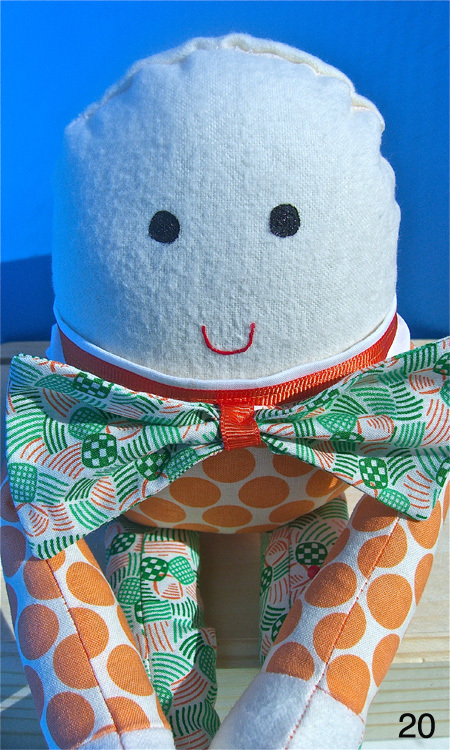 I stitched it onto the very top seam on my Humpty's head. I only stitched across the top, so that I could pull the face forward and then pull it back when not in use. As I stitched, I tried to pull the fabric as flat as possible, so that it would lay mostly flat across the face. Then I trimmed away any excess fabric. That's the long and short of it. 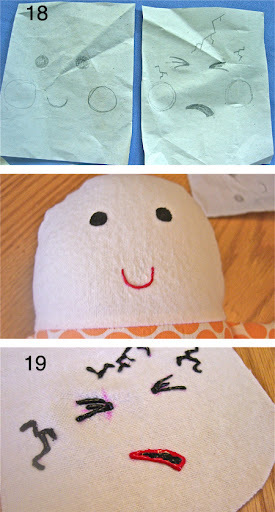 This is my first sewing tutorial. So, I hope all of the steps make sense. 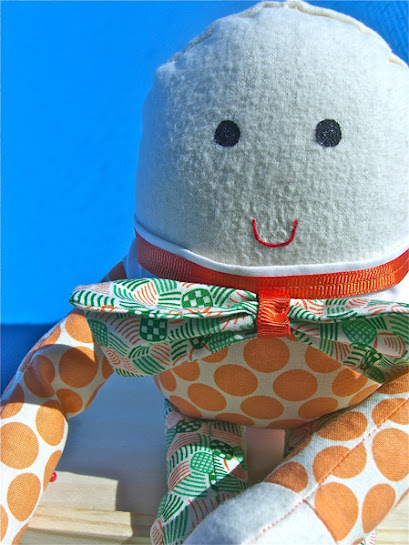 I originally wanted to add some rosy cheeks to my Humpty, then decided against it because I was in a rush and Jellybean wanted the doll right away. I did discover that fabric pastels will work well for that. I also neglected to add a little button detail to the spats. I'll have to get on that. One final note, I don't have a clever way of hiding the "cracked" face when not in use. I thought about putting a little hat on top of his head to tuck it into or just attaching a bit of velcro to the back of his neck. If you come up with something, do let me know. Be sure and let me know if you enjoyed this tutorial or if you have questions. He made a design and wanted him in plain fabric (he is 4). He is delighted with the finished product and I am delighted with your pattern. 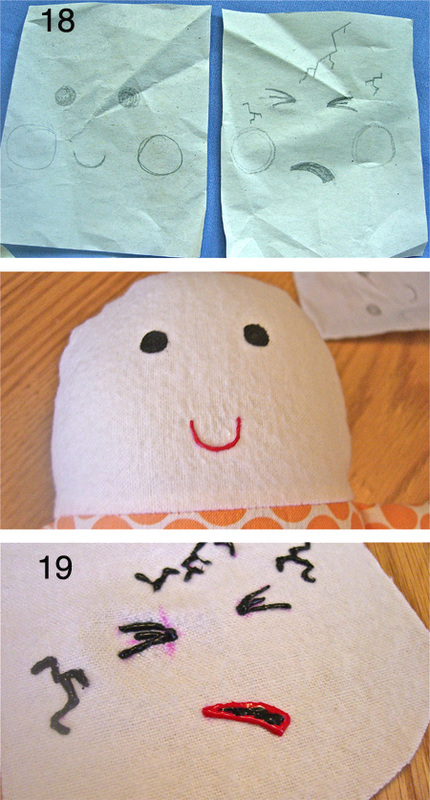 worked really well, and I don't sew much at all. Thanks heaps! So great to hear that it worked well for you and your son!